A while ago I checked out Suicide Squad (2016) with the Captain America to my Ant-Man, the Ricky Bobby to my Cal Naughton Jr., the Chazz Michael Michaels to my Jimmy MacElroy, aka my former bro-worker Philippe. 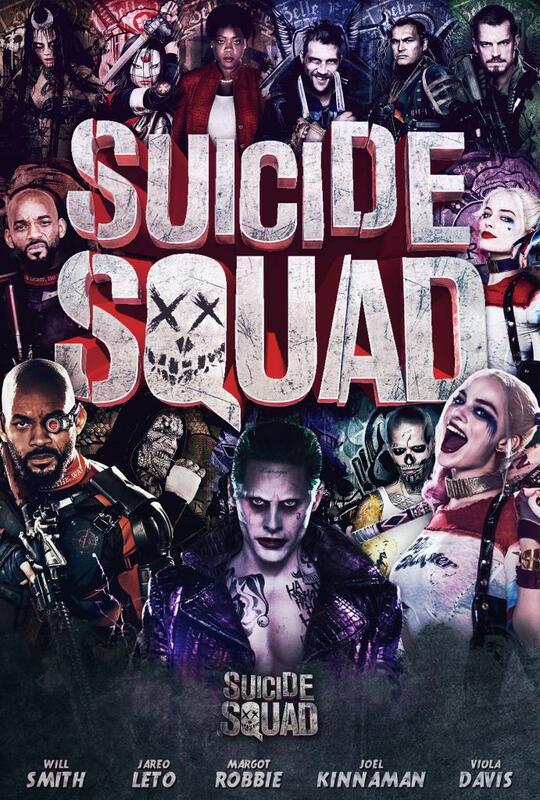 I had heard some not-so-positive reviews, but the teasers looked awesome, my celebrity crush Cara Delevingne is in it, and I was very curious about Margot Robbie's Harley Quinn and Jared Leto's Joker. So much has been written about the latter's dedication to the role that I couldn't help but wonder if his performance would compare to Heath Ledger's. Intelligence operative Amanda Waller (Viola Davis) assembles Task Force X in the aftermath of Superman's death in Batman v. Superman: Dawn of Justice. Task Force X consists of elite hitman Deadshot (Will Smith), former pyschiatrist Harley Quinn (Robbie), pyrokinetic ex-gangster El Diablo (Jay Hernandez), Captain Boomerang (Jai Courtney), mutant Killer Croc (Adewale Akinnuoye-Agbaje), and assassin Slipknot (Adam Beach). One of Waller's intended recruits is Colonol Rick Flag's (Joel Kinnaman) girlfriend Dr. June Moone (Delevingne). Moone is an archaeologist possessed by a with-goddess known as the "Enchantress". Enchantress quickly turns on Waller, deciding to eradicate mankind. Director David Ayer never bothered with a plot, instead introducing his colorful characters over and over again in the first half of this 123-minute DC Comics vehicle, laying the scene for something that could have been exciting, but never really unfolds. The characters are interesting yet flat, but thanks to some Deadpool-inspired gallows humor, I still enjoyed the watch. There was a lot less of Leto's Joker than I anticipated, but at least the performances of Will Smith and Margot Robbie packed a punch.